The taj mahal is one of the wonders of the world, it is also included in the list of world heritage sites. 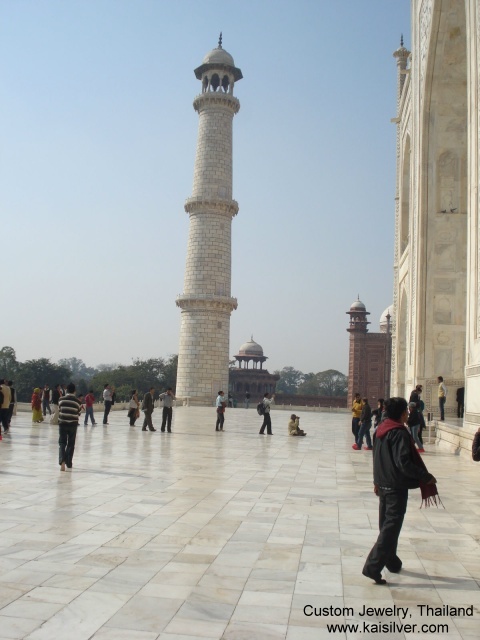 This spectcular monument is situated in the city of Agra in India. The river Yamuna flows by it's side - something that has not changed for the many centuries that the Taj has existed. 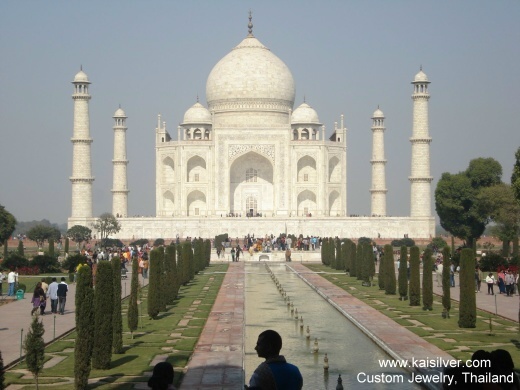 It was built by the Mogul Emperor Shah Jahan in memory of his wife, Mumtaz Mahal. What many people do not know is that Mumtaz Mahal never really stayed at the Taj Mahal. Shah Jahen built it in her memory, she was his 14th wife and died while giving birth to his 13th child. While it is undoubtedly a very impressive monument that clearly shows his deep affection for Mumtaz Mahal, the history books often do not go beyond that. In this brief write up we talk about the Taj Mahal, scattered through the writings are some very interesting pictures of the Taj Mahal. Undoubteldy one of the most recognized constructions on our planet. Constructed from white marble and decked with intricate carvings and gem stones, the Taj Mahal took over 20 years to be completed. The front view of the Taj Mahal in Agra, shows the impressive tomb on top, you also see the four tall minarets one in each corner. Just remember that this construction was done way back on 1631 and completed in 1653, the amount of effort and dedication put into the building of the Taj Mahal can we well imagined. The above photograph of the Taj Mahal gives you a better view of one of the four minarets. The minaret towers above the white marble flooring, each minaret has a stair case and leads to the viewing spot in the top of the minaret. There is something very interesting about the minarets constructed in each of the corners. If you watch the Taj Mahal and the minarets from a distance, you might notice that the minarets are not straight. They seem to be tilting outwards away from the monument. You might conclude that this as due to a construction problem or brought about by the passage of time. However the truth behind the tilting minarets surrounding the Taj Mahal is a technic intentionally implemented by the architects who designed the monument. They feared that an earthquake could cause the minarets to fall on the Taj Mahal, it was hoped that a tilt outwards would cause the minarets would fall away from the monument. 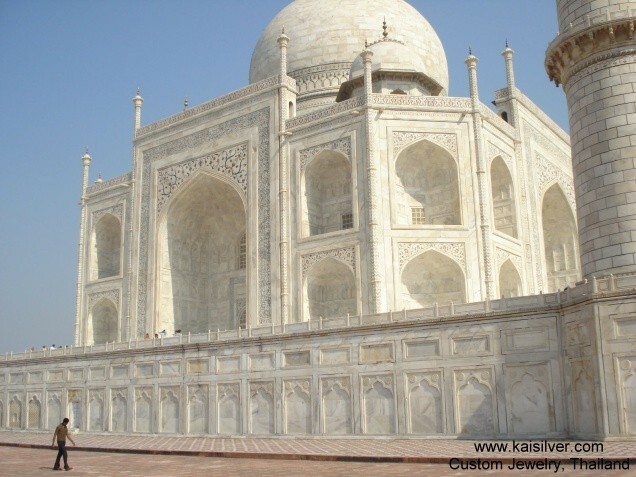 Here is a closer view of the Taj Mahal, the intricate etchings of the white marble are clearly visible. Some of these etchings are inlaid with jasper. A more liberal use of gemstones is made in the decorations that make up the construction inside the building. In a way, the markble used to build the monument was more like a mosaic. Smaller slabs and pieces were carved or etched and then set close to each other. 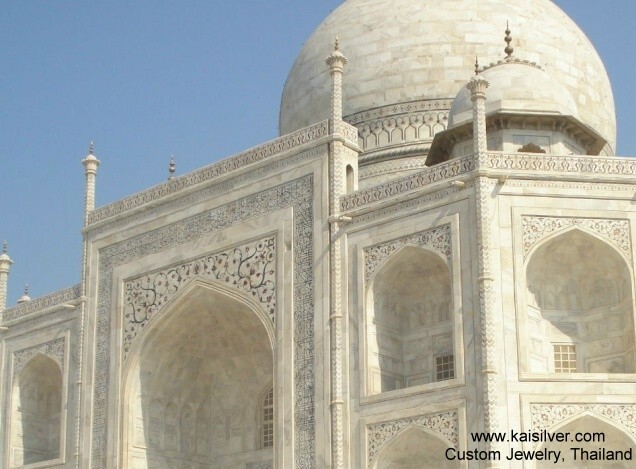 It is reported that over 20,000 craftsmen and artisans were used to complete the Taj Mahal. This over a span of 20 years and a cost of around 7 million U.S dollars. This might seem like a modest amount today but, in those days it was a gigantic amount of money to be used to build just one monument. Much of the material used to build the Taj Mahal had to be transported for hundreds of miles, the effort used to handle this can well be imagined. A unique view of the wall that surrounds the Taj Mahal. The wall is as intricately designed as the monument itself. The classic mogul influence to the design can be clearly seen in the above image. While we eloquent words and rave reviews pay their respects to the Taj Mahal, there is a sad and tragic backdrop to this story. When Shah Jahan saw the Taj Mahal completed he was stunned by it's beauty. He wanted make sure that there would never any other monument that matched the beauty of this monument. To ensure that his dream remained true, he ordered that the hands of all the craftsmen be chopped off. History does not reveal whether he looked after the families of the 20,000 maimed craftsmen after doing that. While the Taj Mahal proves the love and loyalty that Shah Jahan had for his beloved Mumtaz Mahal, it also highlights the utter selfishness that prevailed among rulers during that time. Shah Jahan did not have a comfortable life when he grew old. He died a prisoner, imprisoned in one of the buildings that overlooks the Taj Mahal. He was imprisoned by his own son and left to die in a dark prison. He left back a monument that is visited by millions of people each year. You can read more articles on interesting places at http://www.leisure.food-recipe-cooking.com/leisure-travel-thailand-th-02.htm You are welcome to send in your comments to easyrambler@rocketmail.com we will be glad to hear from you.